This delicious cheese is flecked with rosemary leaves, adding a unique twist to a classic flavor. Made from the same sheep's milk as the famous Manchego cheese, the only difference is the addition of rosemary. Aged for about 4 months, it has a similar flavor profile to a mild, young Manchego with the additional taste of rosemary that evokes the countryside of La Mancha. For generations, some suppliers have coated their cheeses with rosemary. The Alvarez Valera family decided to bring this flavor to a new level by introducing chopped fresh rosemary leaves directly to the raw milk. 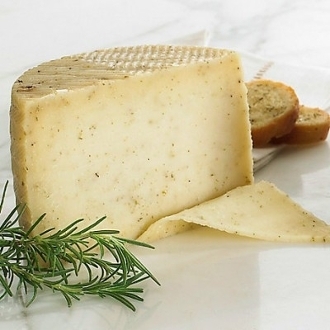 Through the aging process this aromatic herb infuses the cheese, perfectly balancing the sharp, flavorful sheep's milk. Buenalba cheeses are produced only using milk from the company's own herd of Manchega sheep. They are milked within sight of the cheese facility, allowing the rich cream to be introduced to the cheese making process in minutes. Milk loses quality quickly after milking, so this proximity matters. This is the reason the family can produce a cheese that does not require pasteurization, preserving the original complex flavors of each wheel. Buenalba cheeses also come in wine infused and smoked paprika flavors.